Should You Build A Wood or Composite Deck? 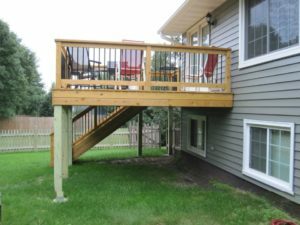 Lately on our WCCO radio show, we have had a lot of inquiries regarding decking; especially the hard decision whether to build one with wood or composite decking. Below, we have broken out the features and benefits of both, making your decision easier to decide which material fits your maintenance level, lifestyle and budget! Wood decking has been around forever so with this choice you really can’t go wrong. The quality of your deck will depend greatly on the type of wood you choose. Southern Pine is a very popular choice because of its lower cost and availability. However, it can easily warp and requires more maintenance than higher end wood such as Cedar. Cedar gives off an awesome smell and is readily available and will weather much better than pine. Cedar is probably the most popular choice of wood decking throughout the US. If you want to step it up a notch, mahogany or IPE (pronounced ee-pay) also known as Brazilian walnut. IPE is one of the densest hardwoods on the market and is three times harder than cedar. It also has the same fire rating as concrete and steel! Wood decks are not that hard to maintain, but will require more elbow grease than composite decking. 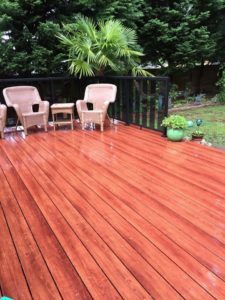 It is recommended to seal and stain your wooden deck every three years or so and that will directly relate to the quality of product you used to begin with. We recommend using PENOFIN®. Composite decking received a bad rap in recent years due to the product having many issues with warping in all different kinds of climates. Rest assured, composite decking has come a long way and is back with a vengeance in the deck building industry. Composite decking consists of some type of plastic material and wood particles. A lot of the time the plastic material is made of recycled by-products such as milk jugs and soda bottles. 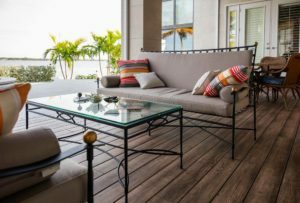 Some composite decking materials are hollow boards that are cheaper than solid ones and don’t tend to expand and contract as much as solid boards. Solid boards look more like real wood and are stronger than hollowed out boards. The cost of composite decking typically starts at $7 per square foot to double this. Factors that determine price include the manufacturer, materials used whether it is recycled, virgin etc. and also any extra features such as UV protection and scratch resistance. Composite decking involves more upfront costs but will require significantly less maintenance than wood in the long-run. Composite decking is considered low maintenance decking, but don’t get it confused with a completely maintenance-free product. Just like anything else on the exterior of your home, your deck is susceptible to the outdoor elements such as mold, fading from the sun and scratching due to hail damage. Composite decking is not 100% foolproof, so be realistic and know that it can become scratched, faded and warped just like traditional wood because it is not 100% indestructible.